Telangana Public Service Commission released the supplementary TSPSC Group II Notification 2016 for 1032 vacancies (439 old and 593 New). Interested candidates can apply for this latest recruitment from 02 September 2016 mid night. In the month of December 2015, TSPSC released notification for 439 vacancies in Group II cadre. Many candidates were applied before the last date and board want to conduct the examination in early 2016. To add other vacancies, it has given stay and released now other new advertisement for 593 vacancies. Candidates who have applied earlier, no need to apply again for Telangana PSC group 2 latest recruitment. These Group II Services are in the posts like Assistant Section Officer, Deputy Tahsildar, Prohibition & Excise Sub Inspector, Executive Officer Grade-I posts. A total of 1032 posts are going to be filled through the supplementary TSPSC group II Notification 2016 of advt no: 17/2016 to 20/2015 Group II Services. Interested people of state can make Telangana PSC One time registration before applying online. You can receive ID, password and OTR to your mobile number and registered email. 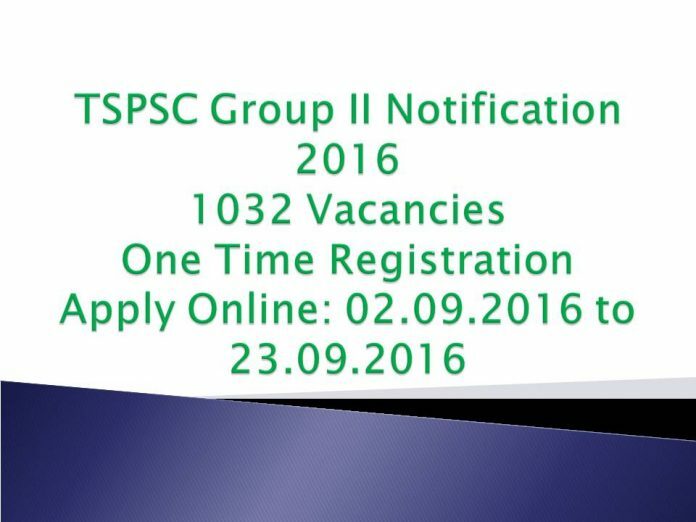 TSPSC group 2 online application is available from 02 September 2016 to 23 September 2016. Candidates with degree as qualification can apply for these latest Group II Services. No candidates shall submit more than one application, candidature of candidates with more than one application is liable for rejection. People should have attained min age of 18 years (for some posts) and 20 year to be applicable for Telangana Group 2 services. Online application processing fee of Rs. 200 and Examination fee of Rs. 120/- has to pay through SBI e-pay at the time of online registration application. TSPSC Group II Services written examination shall conduct on 12 & 13 November 2016. The exam will be conducted in OMR Sheet at various examination centers like Adilabad, Karimnagar, Warangal, Khammam, Hyderabad, Ranga Reddy, Nizamabad, Mahaboobnagar, Medak and Nalgonda and important sub centres in the District.